Mushroom Model Publications (MMP) is based in the U.K. All their books are printed by their associate Stratus in Sandomierz, Poland in the English language. Stratus also does their own line of books in both English and Polish. This book came out last year (2014). It is hard-bound of 36 pages. However, the pages are numbered beginning with page 4 through 38. Strange! In is in 8 ¼” x 11 ¾” page format. You have to turn the book ¼ of a turn to read the pages that are printed across the height of the pages, instead of across the width like normally. 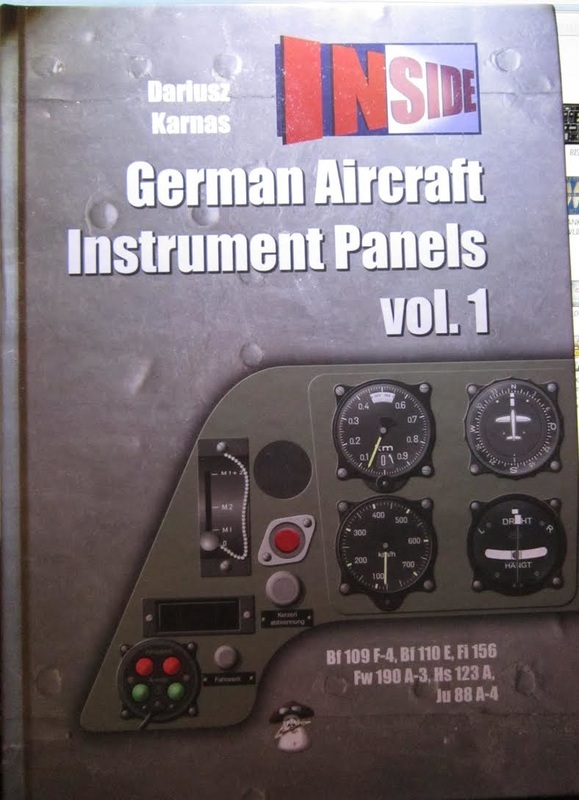 The book contains illustrations of the instrument panels and instruments in the cockpits of the Bf-109F-4, the Bf-110E, the Fi-156, the Hs-123A, Fw-190A-3 and the Ju-88A-4. For each aircraft there is a illustration spanning the height of the page of the instrument panel with gauges in place, followed by a page with just the instrument panel frame, minus the instruments. In each hole of the frame illustration there is a number and below the illustration a numbered list that tells what each instrument, knob, lever, button etc. is. Remaining pages have large color illustrations of each individual instrument etc. These illustrations are all in color. A short paragraph or two gives the history of the aircraft. In the section about the Bf-109F-4, there is a black and white photo of a Bf-109F-2 cockpit of Werk Nr. 12764 flown by Hptm. Rolph Pingel which he landed in the U.K. and a black and white photo of an eary Bf-109F4 flown by Major Molders as Kommondore of JG-51. The short history appears on this page also. This section also has a black and white illustration out of a tech manual of the armament and gunsight that was in the Bf-109F and a 2-view color illustration of that Revi C/12C gunsight. The second aircraft featured in the Fiesler Fi-156 “Storch”. It too has a short history, followed by a black and white photo of Fiesler Fi-156B-O, werk Nr. 625, fuselage code D-1KVN in flight and a black and white illustration of the cockpit from the tech manual. This followed by the color illustrations of the instrument panel and instruments etc. The third aircraft featured is the Henshel Hs-123. Again, it begins with the short history and a black and white photo of Hs-123A, werk nr. 2273, fuselage code S2+I.51 sitting on a grassy field and a black and white photo of the cockpit interior from the tech manual. This is followed by the color illustrations of the instrument panel and instruments etc. This is followed by black and white illustration out of the tech manual of the Revi 3a gunsight used in this aircraft and a color illustration of it. The fourth aircraft featured is the Messerschmitt Bf-110E. The short history starts the section with a head on photo of a Bf-110E-2 of III/ZG 26 that was captured by the Allies in Libya. It is sitting on the ground. A black and white photo of the cockpit, looking forward from the observer’s seat is shown from a tech manual. The fifth aircraft featured is the Focke Wulf Fw-190A-3. This section also begins with the short history, followed by a black and white photo of a Fw-190A-3 in the Netherlands, summer 1943, sitting on the ground running it’s engine up. A photo of a Fw-190A-3 cockpit, was taken after German pilot A. Faber mistakenly landed his plane at RAF Pembrey on 23 June 1942. A cut-away illustration out of the tech manual is of the Revi C/12C gun sight, along with 2 views of sides of it also from the tech manual. The sixth aircraft featured is the Junkers Ju-88A-4. The section also begins with the short history of the plane, followed by a black and white photo of the cockpit interior and an in-flight shot of a Ju-88A-4 of II.KG 30. In addition to the instrument panel and instruments illustrated in color there are two photos of the Stuvi 5B bomb-sight used in the Ju-88. This is one neat book for modelers that want to go the extra mile detailing the cockpits of any of these aircraft. The color illustrations show every instrument, meter, dial, lever, button etc. inside the cockpits of these aircraft. I want to thank Dr. Roger Wallsgrove, Editor-in-Chief of MMP and the folks at Casemate Publishing who sent me this review copy.